The popularity of Celtic tattoos has increased greatly since the time of Celtic warriors nearly 400 years ago. Celtic warriors were the first to use Celtic tattoos, and they used them as a war tactic. Celtic warriors also fashioned their hair in bright mohawks using flower pastes. Most of the time, they went into battle bare-chested or even naked. All these were war techniques to intimidate their enemies. Some tattoos were meant to intimidate while some were meant to show their passion and bravery to fight. Back in the day, Celtic tattoos were done using dye from the Woad plant. The plant was harvested and then dried, and the dry leaves were boiled to create a paste that was then used to create these beautiful Celtic tattoo designs. Tattoos talk, and many people love tattoos because the symbols convey different meanings. Celtic tattoos typically show courage, bravery, and power. 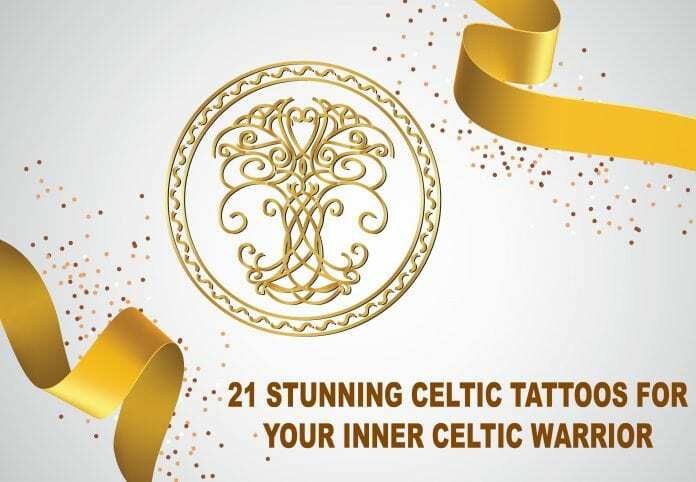 Below is a list of 21 Celtic tattoos and designs that will bring out your inner Celtic warrior. Animal tattoos show love for animals and also possession of specific animals characteristics. The dog of war tattoo shows you’re courageous and brave and it is mostly placed on the arm. A knot is a religious symbol that stands for eternal life. Celtic colored knots show that there is something you believe in that has no end. Celtic knots are best placed on the arm, chest, and shoulder. This old war tattoo, similar to the Viking compass, has a stunning look. It symbolizes bravery and power. It can be drawn in combination with a dragon and a warrior tattoo to make it more appealing. It’s mainly placed on the upper arm or shoulder. A tattoo with more than one animal drawing shows that your powers and abilities are not limited to those of a specific animal – but many. Animal tattoos like these are usually placed on either the arm, chest or shoulder. This tattoo portrays unity among the practical, natural and magical spirits. The three legs are known to represent the land, sea, and sky. Having this tattoo on your body shows that you have extra power and you have nothing to fear. This is a combination of an old world symbol similar to popular Viking tattoos and a Celtic tree with some birds. The Celtic tree with birds shows the love for nature. It is best placed on the upper arm. A dog tattoo is a symbol for bravery. Having this tattoo shows you can be cruel and brave at the same time. It can be drawn on the upper arm, chest or shoulder. Celtic animal tattoos show ferocity, courage, and protection. They can also show love for specific animals. Animal full sleeve tattoos show strength and courage. This is a very popular Irish tattoo. The Celtic cross symbol has more than one meaning. To some people, it is a sign of unity, while to others it’s a religious symbol. Cross tattoos show you have spiritual powers or connections. The tattoo is best placed on the arm or back. This is a very popular tattoo drawn on the upper arm. The tattoo symbolizes unity among a group of people with the same tattoo design. Dog tattoos like these are usually placed on the arm, chest and also shoulder. This is an amazing tattoo that symbolizes the life of a woman. It shows the three stages of a woman’s life: a young girl, mother, and grandmother. Celtic dragon tattoos like these are mostly drawn on the shoulder and symbolize bravery and courage. This colored tattoo design is mostly drawn by those who want to fill their arm with drawings hiding their skin completely. The tattoo shows brave and self-dependence. This tribal arm tattoo was used to show the strong unity and connection among the Celtic warriors. In the current world, it can mean an endless flow of life or powers. This tattoo shows unity among a group of people with this tattoo. It can be drawn on the upper and lower arm, chest, and shoulder. The dog design in this tattoo shows protection and brave. This Celtic animal tattoo has many different characters in it. A person with this particular tattoo can be lovely, peaceful and protective. This is a very popular Celtic tattoo drawn on the arm by Celtic culture enthusiasts. This tattoo has no specific meaning but it is a general sign for bravery and protection. This tattoo is similar to number 16 only that it is drawn on the lower arm. It symbolizes courage, bravery, and protection. This Celtic compass tattoo is mostly drawn on the shoulder. It can be spiced up with animal drawings as well and it shows bravery and determination. This amazing tattoo can be drawn on the chest or the upper arm. The two horses symbolize power and bravery. This tattoo is a combination of a Celtic cross and a Celtic dog. The cross is drawn inside a circle which is then extended to look like a worn wristwatch. It shows bravery and power. I am a tattoo fanatic and love all things Celtic. Read through the rest of my blog to see cool Viking and Rune tattoos. How Long Do Henna Tattoos Last? What Does a Semicolon Tattoo Mean? © Rune-Tattoos.com. All Rights Reserved.